This entry was posted on June 18, 2011 by Megan @ When Harry Met Salad. It was filed under farmers market and was tagged with farmers market, fresh produce, rhubarb, spring, strawberries, whitefish. Oh great, now I want donuts for breakfast! Unfortunately, (or maybe fortunately) we don’t have a donut vendor at our market. It is one of the things I miss the most about the Farmer’s Markets when I lived in Washington, seemed like every one had good donuts. We often joke about doing one ourselves. Sorry to hear you missed out. We have the same problem this time of year, not so much with tourists, but just the fact that we have limited produce and a lot of people looking for it. I’ll be leaving soon for our market, or maybe I should make some donuts first!! Better luck to you next week. I wish I had a good market near me – I would be there all the time! I recently came across your blog and have been enjoying it. I love the title. I wanted to nominate you for the Versatile Blogger Award. Accepting comes with a few rules…. I will go out and buy strawberries and donuts tomorrow morning. 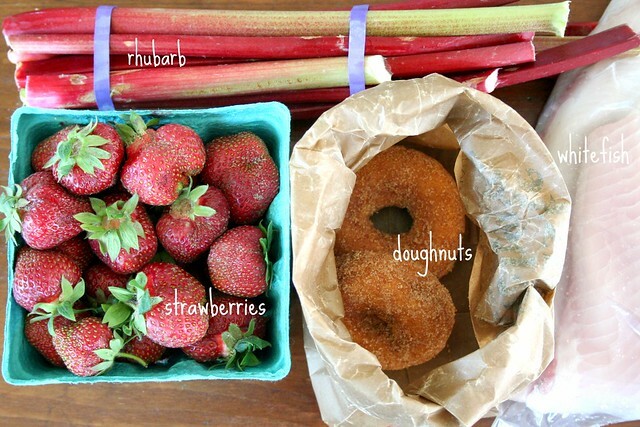 My taste buds are watering right now of the thought of donuts and strawberries! Yum! !